Rep. Joe Sestak (D-PA), who wants Sen. Arlen Specter’s (D-PA) Senate seat, is needling his opponent over his role in preventing the confirmation of one of President Obama’s top Justice Department nominees. In a letter to Specter, Sestak lays the fact that Johnsen’s nomination stagnated and expired at his rival’s feet. “Senator Specter, President Obama is giving you a second chance to support his nominee to lead the Office of Legal Counsel,” Specter writes. After you joined your Republican colleagues in successfully blocking Professor Dawn Johnsen from receiving a fair up-or-down vote last year, the President has decided to resubmit her nomination this year. With Democrat Senator Ben Nelson opposed to Johnsen, but Republican Senator Richard Lugar strongly in favor, that means that all it takes is your vote to put a principled, qualified progressive in this key position. 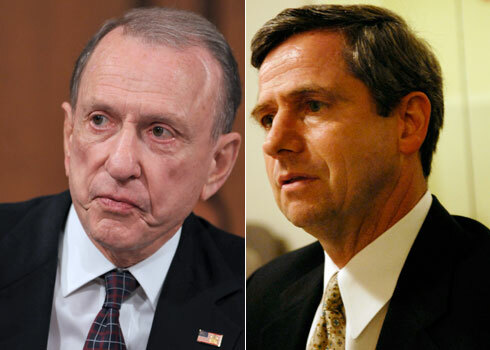 Sestak goes on to allege that Specter might not want Johnsen–known for being a strong critic of Bush administration policies–to have the power to pull back the veil on a number of government scandals. Collaborated with the Bush White House to write legislation to allow wiretapping to continue. Used your power as Chairman of the Judiciary Committee to secretly insert language into the PATRIOT Act reauthorization that allowed the Attorney General to appoint U.S. Attorneys without Senate confirmation — a provision that contributed to the Bush Administration’s firing of attorneys who failed to bring politically motivated charges against Democrats. Voted against banning water-boarding and other “enhanced interrogation techniques” by the CIA and other intelligence agencies. As a Democrat, you will need to repair this record, and allowing Professor Johnsen to lead the OLC will be a good start. To prevent the vote for her nomination from lingering on the Senate calender for 280 days without ever being taken up — as it did last year — you should publicly announce your support for Professor Johnsen and call for a prompt vote when the Senate returns to session. Sestak has been unusually effective at pushing the incumbent Specter to the left since he entered the Pennsylvania Senate race last year. But it’s worth pointing out, he’s hit Specter over Johnsen in the past, to no avail. Johnsen’s nomination almost died on the vine last year, but was salvaged when the White House announced President Obama’s intent to renominate her to head the OLC earlier this month. You can read the entire memo below. SUBJECT: Democratic Tip Sheet #2 — Support Key Obama Nominee (This Time)! Senator Specter, President Obama is giving you a second chance to support his nominee to lead the Office of Legal Counsel. After you joined your Republican colleagues in successfully blocking Professor Dawn Johnsen from receiving a fair up-or-down vote last year, the President has decided to resubmit her nomination this year. The Office of Legal Counsel is one of the most important offices in the Department of Justice and determines the legality of actions by the President and the Executive Branch. Because of your obstruction, President Obama is trying keep the country safe from terrorism, end two wars, and close the prison at Guantanamo Bay without a critical legal adviser. I understand that when you switched parties you pointed to your unequivocal opposition to the health care public option, your condemnation of the Employee Free Choice Act as a “bad bill,” and your rejection of Professor Johnsen as demonstrations of your commitment to not be a “loyal Democrat” — but you switched your position on the first two, and coming through on a second chance to again change your position and support Professor Johnsen would be a tremendous benefit to the nation. As you know, the Office of Legal Counsel was home to President Bush’s “torture memo” writers, and many of their controversial legal opinions protect Bush Administration officials from potential prosecution. Having Professor Johnsen, a prominent critic of Bush Administration legal practices, take over the office would do much to restore our nation’s commitment to the rule of law.